The dial of rotating years has once again brought an anniversary day of the birth of one of the most distinguished son of the country. This person is not only remembered and revered, but also among the most distinguished in the annals of our national history. 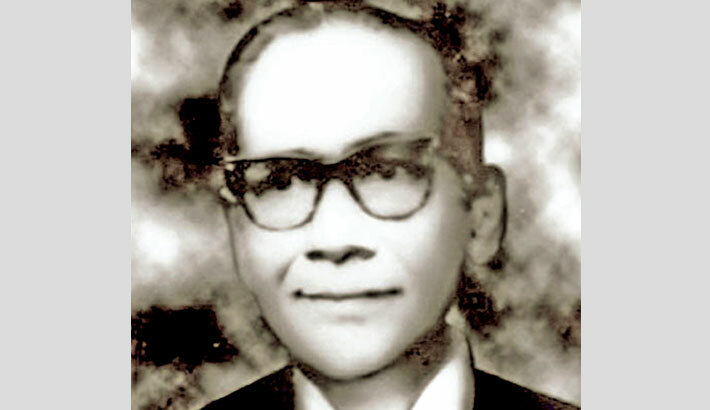 He is none other than Syed Mahbub Murshed, the late Chief Justice or Justice Murshed as most of us refer to him. Yet while approaching another anniversary of his post centennial birth, the minds of today’s masses who keep learning about him with appreciation, continue to wander into the world of nostalgic historical memories. Born after the first decade of the last century, Murshed was a very prominent figure and a most striking personality. Although, he had a most aristocratic background, he undoubtedly remained an articulate spokesman of the collective feelings of the repressed and subjugated people. Along with his incomparable notable heritage, he also had very brilliant academic results both at home and abroad with high merit and distinctions all through and this culminated in his becoming a Barrister in England at the honourable society of Lincoln’s Inn in 1938. In life Justice Murshed rose to the eminence of the highest order as a jurist imbued with a deep sense of social justice. His contribution to the field of literature and belles-lettres was no less outstanding. In all, Murshed lavishly bestowed upon us a vast store of wisdom on various subjects such as constitutional law, jurisprudence, literature and politics, not to mention innumerable social causes. As a judge and later as Chief Justice he was a fearless exponent of the rule of law. Admiration came his way from all walks of life, particularly for his courage. Yet he was able to interpret these themes in his own inimitable fashion. As expressed in his own words, “It is not the use but the abuse of power that the Courts should seek to readdress.” Murshed’s judicial pronouncements, while sitting at the bench of the High Court and the Supreme Court of Pakistan where he served as an ad-hoc judge, then as Chief Justice reflected the lofty ideals of liberty, justice and excellence. Some of his judgments, created constitutional history and became landmarks which won for him both national and international acclaim. From the bench, his verdicts went against the Ayub-Monem dictatorship. Around five decades ago, when our country was under alien rule, it was Murshed who stood up to fight for the age old traditions and cultural identity of Bangladesh. It will always be remembered that in 1961, he organised the “Tagore Centennial Celebrations” in Dhaka and other parts of the country, which is now our free Bangladesh. The great tide of nationalism which swept the country in the nineteen-seventies had originated from the ripples that were noticeable in the fifties and sixties. The distinguished person who figured most prominently in this process was Syed Mahbub Murshed. The fight for a separate identity became, through a process of metamorphosis, a struggle for nationalism. The stirrings of a nation in the making, in the late nineteen-fifties and sixties, found eloquent expression, which were reflected in the manifold speeches, judgments and writings of Justice Murshed. In this sphere, he became the most articulate spokesman of Bengali nationalism. Remaining the humanist that he was in the late fifties and early sixties of the last century he was the President of the Red Cross. Deep down, Murshed was a Sufi and a liberal Muslim and spoke of tolerance which was against any form of communalism. Furthermore, after the communal violence that shook the sub-continent in the partition year, he was one of those men who were primarily responsible for setting into motion the process that culminated in the Liakat - Nehru pact. In addition to his monumental work, another significant contribution by then Chief Justice Murshed was that he gave final touch to the drafting of the historic six points in 1966 for provincial autonomy which was the demand of the Bengali intelligentsia. This was what Sheikh Mujib fought for and was jailed. In early 1954, while he was still a practising lawyer, the 21 point manifesto of the Jukta-front government was drawn. Later this was summarised by Justice Murshed as the famous six points. Murshed, also like Sheikh Mujib, made the clarion call for provincial autonomy of the then East Pakistan. At a critical time in our history, Murshed resigned from the post of Chief Justice to join the masses for the fight for democracy. Among the first things that he did was to help organise the defence of the Agartala Conspiracy case. Subsequently, Murshed entered politics directly, which added a major momentum to the anti-Ayub movement. It was because of Murshed, who was leading the charge during the mass upsurge, that Sheikh Mujib was not released on parole but freed. Not only that but it was on account of Murshed’s constant public demands that all the co-accused in the Agartala Conspiracy case were unconditionally released and exonerated. Perhaps what is most significant was that during the round-table conference, while Ayub was virtually on his knees and in addition with the dissolution of the one unit in West Pakistan, Justice Murshed demanded one man one vote. Prior to this, in the then Pakistan National Assembly, there was parity of 150 seats each for East and West Pakistan, but as Murshed’s one man one vote proposal was accepted and because of this 169 seats out of 300 came to East Pakistan for the next national election. Therefore, in reality it was clearly Justice Murshed who paved the way as to whoever would be the majority in East Pakistan could form the national government. It was also Murshed’s protest resignation in the late sixties as chief justice that made the intelligentsia find him in the whole country as the only acceptable presidential candidate against Ayub. During our War of Liberation, his refusal to collaborate with the ruling military-junta is also recorded by historians. Hence, in fact it can be said that Justice Murshed is among the founding fathers of Bengali nationalism and a keeper of our national conscience. History will always remember Justice Murshed as this nation’s friend, philosopher and guide. In conclusion, he will remain alive in history as a person who served his community remaining above self-interest.